We used the Brush-Baby when Miss NHM was tiny and she loved it! AND the Brush-Baby team are offering NHM a special discount!!! 😀 (see bottom of the post). I had no idea the business was located near Winchester, just down the road! Over 40% of children under the age of 5 have some form of tooth decay. Babies have more tastebuds in their mouth than an adult and which are more sensitive – hence the reason why some dislike the adult ‘minty’ toothpaste. Baby teeth start to form in the womb and at birth all 20 baby teeth are present under the gums. It’s vitally important to keep baby and toddler gums clean as it helps to prevent severe teething pain caused by the accumulation of food particles and bacteria under tiny gum flaps. The common perception that baby or ‘milk teeth’ ‘don’t matter’, as they will eventually fall out is incorrect. Milk teeth help children to eat, speak and smile. They also act as ‘space holders’ for developing adult teeth and help give the face its shape and form affecting how a child will look. Fluoride toothpaste is important – but it needs to be the correct level for the age of child. Too much fluoride can cause ‘fluorosis’ – which is evidenced by white ‘specks’ on teeth. If your child refuses point blank to brush their teeth, at least try to get some toothpaste in their mouths because then at least fluoride will get in contact with their teeth and gums at some stage! A recent survey conducted by YouGov and Denplan – 69% of parents wish for ‘no tooth decay’ as their wish for children’s oral health. 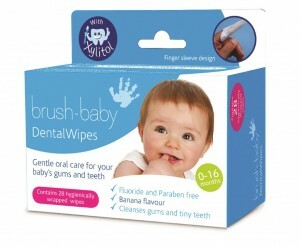 Brush-Baby offer an easy-to-follow 3 step routine, for early years gum and toothcare. 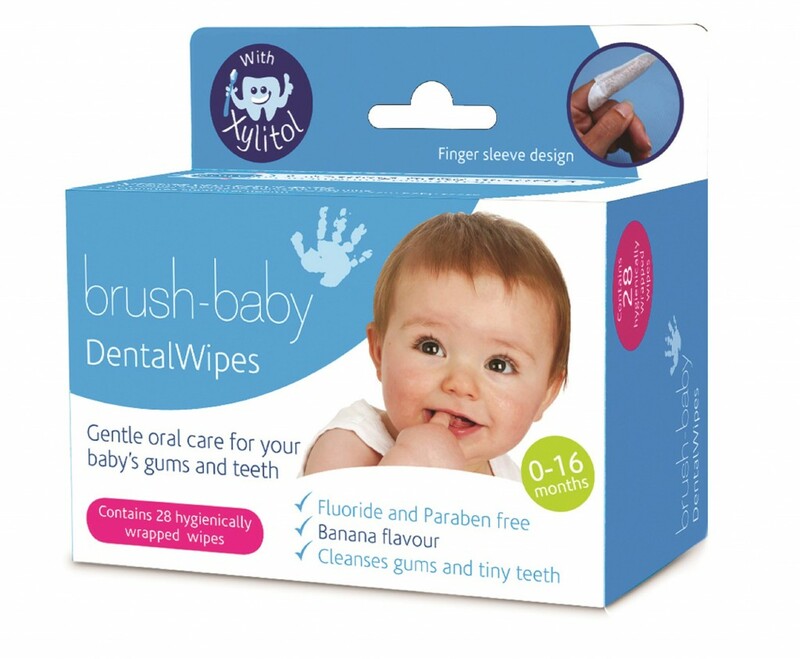 Started by an entrepreneurial mum, based near Winchester, who frustrated by the lack of dental-care products available to her baby daughter, she designed and developed her own unique range which offer ergonomically-designed products for babies, toddlers and children from newborn to 6 years of age, taking into account their skills and behaviours. prepare a safe, clean environment for the development of milk teeth. 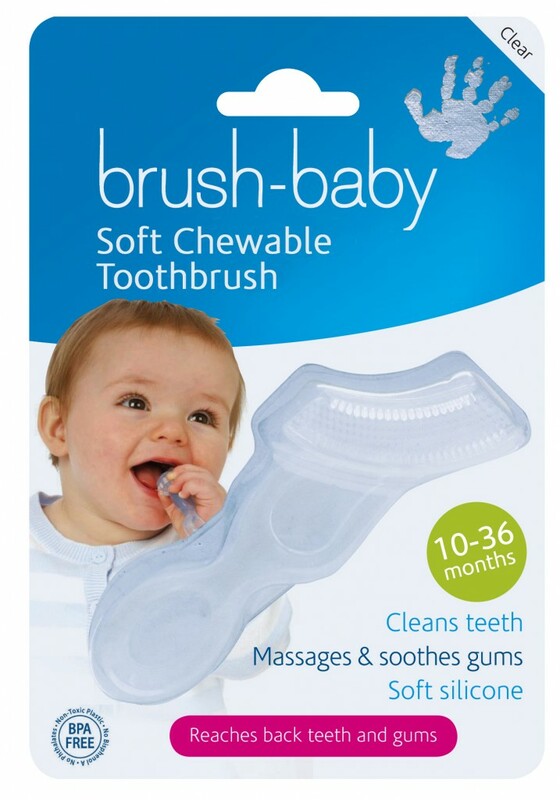 Capitalising upon a child’s natural urge to “chew” – the Chewable Toothbrush/Teether can be cooled in the ‘fridge and used with teething gel to offer relief for sore teething gums. Then as teeth emerge and combined with a small blob of toothpaste, the soft, pliable, top and bottom silicone bristles help clean teeth, upper and lower at the same time including the ‘hard to reach’ back teeth. Familiarity with the Brush and ergonomically-designed the Chewable Toothbrush fit a baby’s dental arch perfectly and they are able to conduct the brushing and cleaning activity themselves with adult supervision. Flossing should be introduced as soon as two teeth start to touch as it removes the plaque that brushing misses. However, many children find it difficult to master the ‘act of flossing’. 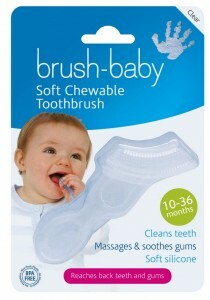 Brush-Baby’s FlossBrush is specifically designed for children as it helps to clean between teeth. Due to their development babies have far more, and in fact, much more sensitive tastebuds than an adult, hence sometimes their dislike of the adult ‘minty’ toothpastes which they may find too harsh and too high a fluoride-content and hence tooth-brushing off-putting. Children’s Tutti Frutti Toothpaste: Great flavour gets kids brushing. Contains both Xylitol and fluoride (1350ppmF) to protect teeth. 10% discount for NorthHantsMum Readers!!! 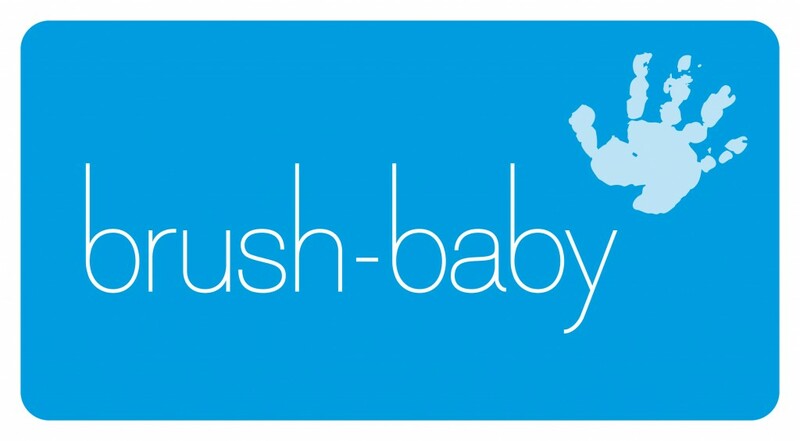 Special offer for readers of NorthHantsMum – Join our e-newsletter to get 10% off Brush-Baby products online at www.brushbaby.co.uk. ← Jump Factory – First Look!!! !